WorshipPlanning.com makes it easy to plan and prepare worship services. You can access your WorshipPlanning account to import individual songs or entire worship events into OnSong. The first time you access this screen, you'll need to sign in. Enter your credentials to view songs and events. Tap on this option to browse and search songs that you've imported into your WorshipPlanning.com account. 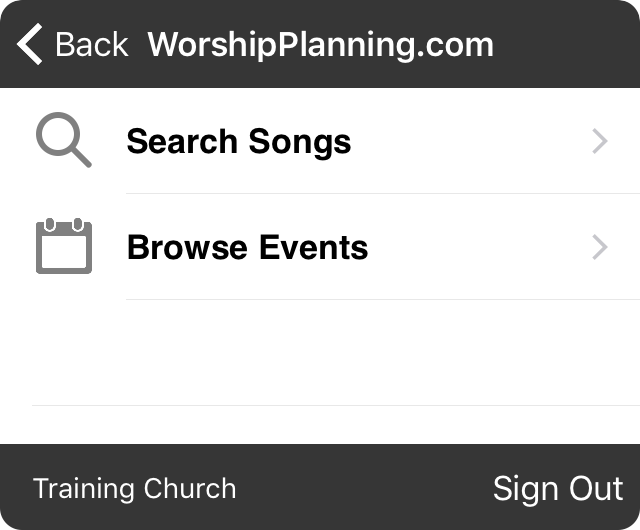 Tap on this option to browse events you've scheduled in WorshipPlanning.com. You can then choose an event to import it as a set into OnSong. The name of the organization that you are signed in as appears on the left. You can use the Sign Out link at the bottom to sign out of WorshipPlanning.com at any time.